A Gap Year - if done correctly - can offer a new opportunity to being accepted at your top choice school. It can also keep you from missing out on the best experience of your life. With college decisions on the horizon, students and their families are bracing for impact. If you’re one of the millions of students nervous about your near future, it’s important to step back for a second, breathe, and consider the impossible: you might not get into your dream school. Harsh, I know, but this can also be the defining moment in many young people’s lives – For The Better! That’s because it’s an opportunity for them to discover the Gap Year option. A Gap Year – if done correctly – can offer a new opportunity to being accepted at your top choice schools. It can also keep you from missing out on the best experience of your life. Here are some reasons why taking a gap year may be an effective strategy for getting into your dream school. 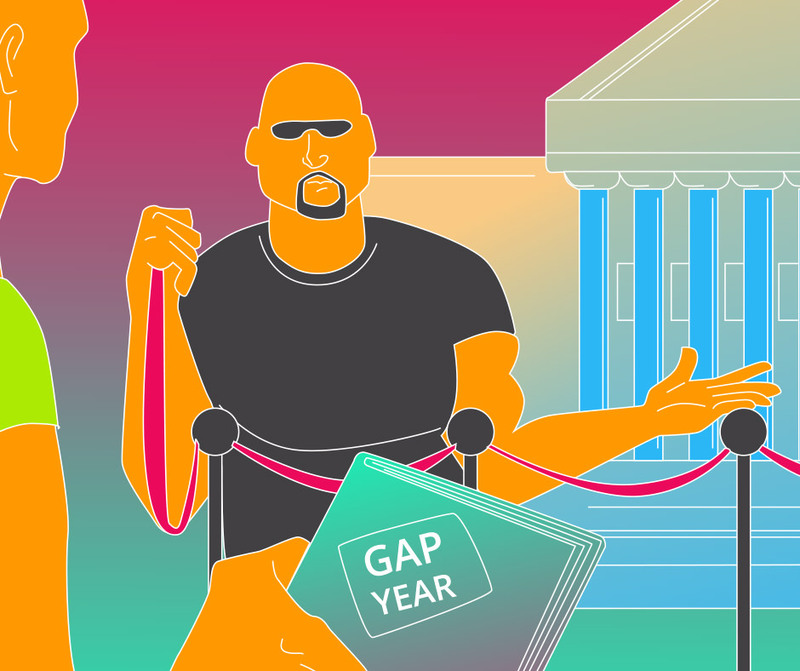 Many colleges are actually encouraging students to take gap years as a way to take a pause after high school graduation. And that’s a smart move for everybody. Gap Year students have proven to perform better academically than their non-gap year peers. The Gap Year stamp on your resume, in addition to your high school achievements, should ultimately nudge your application into the “accepted” pile. According to Business Insider, “Harvard has seen a 33% increase in the number of students taking gap years”. The Gap Year stamp on your resume… should ultimately nudge your application into the “accepted” pile. If you’re enrolled in a Gap Year program, you’ll inevitably be working with superiors who are not only there to teach you but to also help advocate for you. While you may have gotten a lousy recommendation letter from you social studies teacher who had 100 others to write last December, your Gap Year mentors and managers will know your strengths in a way that will allow them to better represent you. A good recommendation letter can sometimes show off a side of you that you weren’t even aware of. In addition to living abroad and gaining valuable life skills, a Gap Year can offer you the chance to spend an additional year digging into the topic that originally motivated you to apply for dream school X. Need to work on your portfolio further for that graphic design program? There’s a Gap Year for that. Want to deepen your computer science understanding to demonstrate your love for engineering? Gap Year program. Never had the time in high school to travel and volunteer? Gap Year’s got you covered. The bottom line is that a Gap Year gives you an unobstructed window of time to dig into something and show your dream school what you’re really capable of. Never had the time in high school to travel and volunteer? Gap Year’s got you covered. This might hurt to hear, but a Gap Year might even reveal to you that your dream school isn’t really your dream school after all. The opportunity to step outside of the classroom and experience the real world has a profound ability to make us reassess our priorities. A Gap Year most importantly offers you space to think, and this is something that all of us – not just high school seniors – need from time to time. Maybe you’ll find out at the end of it all that your passions lie elsewhere, in which case that dream school might have turned into a nightmare. Or maybe, your Gap Year experience will give you the credentials and the confidence to shoot higher and reach for an even better school. Finally, if you’re worried about being sidelined as a “re-applicant” – don’t. Many colleges actually destroy application records and materials at the end of the acceptance cycle in August. This means that when you submit your application you will have the choice between doing it fresh and showcasing your commitment to succeeding at the specific institution. 2017 was a transformational year at United Mint Campus. Across our industry immersion, cycling talent development, and MBA professional development programs, United Mint Campus challenged the status quo and pressed on to make a profound difference.